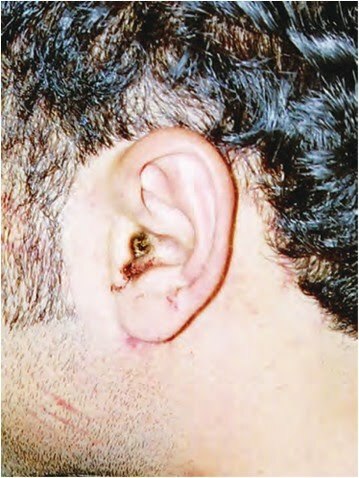 Trauma to the ears, especially rupture of the tympanic membrane (eardrum), is a frequent consequence of harsh beatings. The ear canals and tympanic membranes should be examined with an otoscope and injuries described. A common form of torture, known in Latin America as telefono, is a hard slap of the palm to one or both ears, rapidly increasing pressure in the ear canal, thus rupturing the drum. There is often tinnitus for a while. Attacks of otitis media may supervene. Deafness usually gradually improves as the drum repairs itself. Very occasionally there is dislocation of the ossicles which will cause permanent loss of hearing. Even more rarely, a perilymph fistula may lead to vertigo. 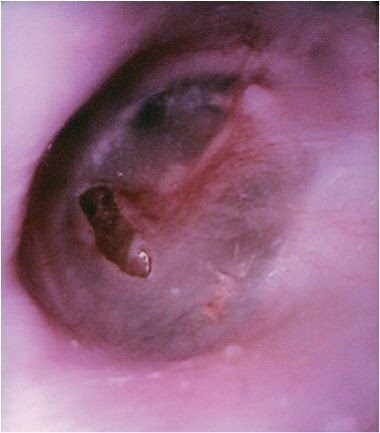 Few of the long-term signs are specific to torture, but a careful history may make the differentiation from disease possible and an expert may be able to differentiate a perforation resulting from trauma from one caused by infection. Prompt examination is necessary to detect tympanic membrane ruptures less than 2 millimetres in diameter, which may heal within 10 days. Fluid may be observed in the middle or external ear. If otorrhea (leaking middle ear fluid) is confirmed by laboratory analysis, MRI or CT should be performed to determine the fracture site. The presence of hearing loss should be investigated, using simple screening methods. If necessary, audiometric tests should be conducted by a qualified audiometric technician. The radiographic examination of fractures of the temporal bone or disruption of the ossicular chain is best determined by CT, then hypocycloidal tomography and, lastly, linear tomography.